The 51-year-old Slovenian lawyer — who saw off Dutchman Michael van Praag in 2016 — is the only candidate in the election this time which will take place at the organisation’s Congress in Rome. Ceferin’s reelection, on a full four-year term, is not in doubt. But the number of votes he receives from among UEFA’s 55 member associations could have an impact on his leadership. Having previously been largely charged with putting in place measures voted for under the previous regime of Platini and Gianni Infantino, Ceferin can now hope to really make his mark. Infantino, who succeeded the disgraced Blatter in February 2016, will also be unopposed when he goes forward for re-election on June 5 in Paris. Reforms to the Champions League which mean the continent’s leading four leagues — Spain, England, Germany and Italy — now all get four automatic qualifying spots in the group stage were initially proposed by Platini but brought in under Ceferin. However threats of a breakaway Super League have been staved off with the signing Wednesday of a Memorandum of Understanding until 2024 with the influential European Club Association (ECA). Andrea Agnelli, chairman of the ECA which represents over 200 leading teams, hailed the agreement as “an important moment in the history of European football”. 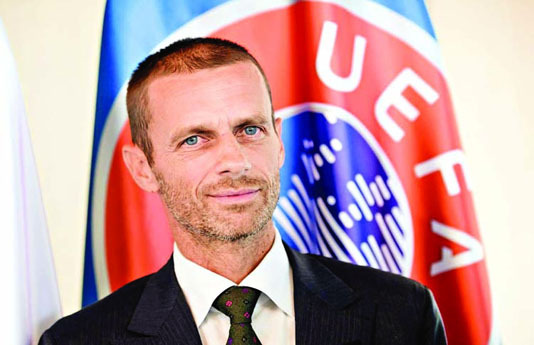 “The Memorandum of Understanding places ECA firmly at the heart of UEFA’s decision-making process, in a manner which properly reflects clubs’ contribution to the development of the game,” added Agnelli, who is also chairman of Juventus.